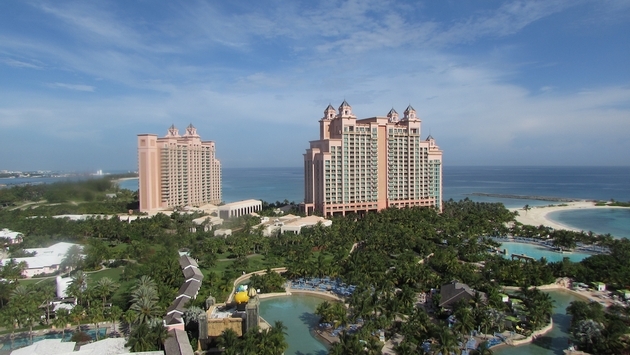 Photo: Atlantis Paradise Island is offering Black Friday and Cyber Monday sale packages. (Photo by Brian Major). Several signature Caribbean destinations are offering fall and winter travel packages that feature discounted rates and sun-splashed special activities. A handful of packages are specially timed to coincide with the Black Friday and Cyber Monday shopping cycles. The Bahamas’ Atlantis Paradise Island resort is offering a four-day Black Friday and Cyber Monday sale offering discounts of up to 50 percent off nightly rates for bookings made between Nov. 28 and Dec. 2, 2014. The offer applies to travel from Dec. 1, 2014 to March 31, 2015 and also features free breakfast and dinner for children under 12 with the purchase of an adult meal plan. Another Caribbean Black Friday offer is on tap from Anguilla’s CeBlue Villas & Beach Resort, which is offering seven-night stays for the price of five nights at the private villa resort. Room configurations range from three bedrooms to five-bedroom family suites that accommodate up to 15 guests. Rates start at $1,200 per night for a three-bedroom villa. Travelers can book stays from Nov.27 to Dec. 1, 2014. Several Aruba resorts have also announced new fall travel packages. The Hyatt Regency Aruba’s “Sunshine in Sale” package provides guests who book five-night stays one free night at the elegant Caribbean resort. The offer applies to bookings made through Dec. 19, 2014. Located on Aruba’s Palm Beach, the resort features amenities including a multi-level pool complex, a casino and multiple bars and on-site dining options. Aruba’s Radisson Aruba Resort, Casino & Spa is already looking ahead to 2015 with an early booking bonus on future travel. Guests who book stays between January 4 and Dec. 21, 2015 through Dec. 31, 2014 can save up to 40 percent, with rates starting as low as $209 per night. The resort’s Discover Program offers guests added value with daily, complimentary health and wellness activities including yoga classes, guided mountain bike tours, stand-up paddleboard lessons and massage classes. In Barbados, the Hilton Barbados Resort is offering “Off the Tourist Trail” packages featuring a guided ATV tour through the rugged Joe's River Tropical Rain Forest; guided visits with native Barbados experts to historic sites including Gun Hill Signal Station Park and Edge Cliff; and lunch in the historic 17th century Sunbury Plantation House great room. Puerto Rico’s El Convento is offering guests an opportunity to travel back into time with “Glimpse Into the Past” packages offering savings of up to $100 on parking, dining and activities. El Convento, resorted from a 360 year-old Carmelite convent, is a boutique luxury resort that is the oldest member of the Historic Hotels of America.